Linje Tio, voted one of the world's 50 greatest bars, is travelling from Stockholm to London this month to pop-up in Wardour Street, Soho, from 31st January 2018, first in The Den for 8 days,and then into the restaurant & club at 100 Wardour Street for 3 days of partying. 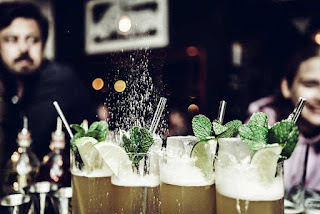 Expect lots of their own cocktails - a great way to say goodbye to January abstainance! "100 Wardour St are excited to welcome one of the World’s 50 Best Bars, Linje Tio, to London. Put away your New Year’s resolutions and get ready to experience our Anglo-Swedish fiesta. Hailing from Stockholm, Sweden, Linje Tio are the first ever Swedish bar to enter the World’s Top 50, where they currently sit at 44. They will take up residency in The Den at Wardour Street from 31st January – 7th February 2018, serving up their creative twists on classic drinks, before moving into the Restaurant and Club from 8th – 10th February to serve up Scandinavian party vibes into the early hours. Expect flavours from all corners of the Mediterranean with a dash of Scandinavian style: they’ve created a cocktail list that combines some of their house classics as well as brand new creations. Look out for Beets By Tjoget, a Scandinavian pina colada containing Absolut vodka infused with beets, coconut syrup, ginger, lemon, and nutmeg, or La Belle Epoque, a luxurious mix of Pierre Ferrand Cognac Amber, absinthe, lemon, and sugar, topped off with champagne. Linje Tio’s The Den residency will be first come, first served, so be sure to find time to come down and try one of these inimitable concoctions before they return to Sweden."